Got an old bicycle that’s seen better days? Why not turn it into a garden decoration/planter! There comes a time when that bicycle you enjoyed riding for years, needs to retire. You might even have that bike sitting in your garage right now . Don’t get rid of it yet because you can convert it into something beautiful and functional. Turn your old bicycle into a planter that also doubles as garden decoration! All you need are baskets to hold the plant of your choice. 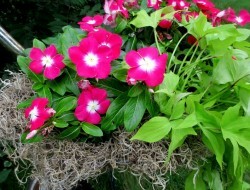 This allows you to switch out plants to keep it colorful and seasonal. And a can of spray paint that suits your color preference. If you can give an old bicycle a new life, imagine the possibilities with all that other ‘junk’ you’re thinking of throwing away! We’re on the lookout for old bicycles, how about you?